Chess tutorial for beginners. Chess pieces. Lesson 2. Chess pieces. Placement of pieces on the board. There is one king and queen, two rooks, two bishops, two knights and eight pawns in each opponent side respectively. It happens that each party has 16 pieces at the beginning of the game. Altogether there are 32 pieces on the board respectively, i.e. exactly 50% of the whole board is initially occupied. It is quite simple to remember initial placement of pieces – pieces are placed symmetrically. Confusion usually occurs only in location of king and queen (they are often confused in places). It is important to remember only 1 rule: in initial setup queen is placed in the field of its own color. 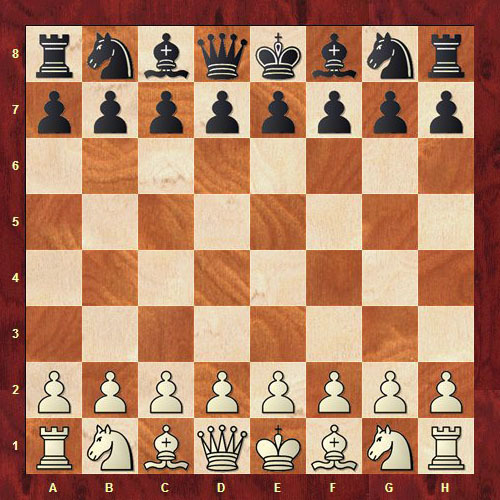 It means that white queen in initial setup is placed in the white square and black queen in the black one respectively. Now you should learn to play with these pieces and capture opponent's pieces. It will be shown in the next lesson. 1. Conversance to chess game. Chessboard. 2. Chess pieces. Placement of pieces on the board. 3. How to move pieces? Pawn, knight. 4. How to move pieces? Bishop, rook. 5. How to move pieces? Queen, king. 8. Checkmate. Result of the game.